Oh happy summer Rochester! With the recent summer solstice, our summer is now official. We know that for Rochester, the warm weather equates to festivals galore: the Jazz Fest, the Cornhill Fest, the Park Ave Fest and so many more to name. Two festivals that I plan on attending next month are the Hopsfest & the Summer Sips & Sounds: Wine and Music Fest. The Hopsfest, which takes place on July 18-19 is hosted by Nedloh Brewing in Bloomfield. At the Hopsfest you will find tastings from over 20 NYS Craft Breweries, a cook-off with 12 local chefs, Seminars, Food Trucks, & Pittsford Dairy Ice Cream...oh my! Summers Sips & Sounds is the following weekend on July 26th and will be held at Long Acre Farms in Macedon with samplings from Lake Ontario distillers, wineries, and a cocktail making class from Apple Country Spirits. I've never been to either one and I'm looking forward to experiencing new festivals with you this summer. Now back to summah time. I know this weekend is a little dreary out with the weather, but rain or shine, no summer would be complete without a pit stop to one of your favorite ice cream spots. In fact, you can start your Ice Cream Adventure by reading my first official publication of 5 Local Ice Cream Spots to check out in the Spring/Summer issue of Mann's Jewelers Accent Magazine. Twice a year, Mann's Jewelers issues a lifestyle magazine that spans outside of just jewelry with articles that speak to local food spots, cocktails, travel, people, fashion, and so on. It is a beautifully crafted magazine and you can actually pick up a free copy at your local Wegmans or in-store at Mann's. I've seen issues at both the Pittsford and Calkins Road Wegmans locations and may have picked a few up with a big, cheesy smile on my face. I've always dreamed of writing in a magazine and am so proud to be featured in this one. Click on the photo above or this link to read the Spring/Summer issue of Accent Magazine. My friend Nicole Kazimer shared a photo of herself reading the article on her Instagram. Eat Me Ice Cream, Hungerford Building, 1115 East Main St., Rochester, 585-455-3701. Lynnie Lou's Homemade Ice Cream & Custard, 8666 NY-21, Naples, 585-374-5980. Moonlight Creamery, 36 West Ave., Fairport, 585-223-0880. Hedonist Artisan Chocolates & Ice Cream, 772 South Ave., Rochester, 585-461-2815. Pittsford Farms Dairy & Bakery, 44 North Main St., Pittsford, 585-586-6610. Instead of rehashing that article, I would love for you to pick up a copy on your own OR click on the following link to view the online version. Trust me, this one is a must-read as I talk about what makes each place so special and the flavors to try. All of these places are worth visiting and I advise you to stop by to each one. Who can say NO to ice cream? Not I. For my bonus feature mentioned in the article, I wanted to tell you more about one place in particular that is going to rock your world, Eat Me Ice Cream. First off, Eat Me Ice Cream is not your traditional kind of mom & pop ice cream joint. They are distinct in every facet - from their inventive ice cream flavors, to their bright and vibrant branding, eco-friendly bike carts they cycle through the city with, and the passion they carry in their craft and supporting the community. Eat Me Ice Cream is for ALL of Rochester to savor, lick, and cry to.....it's that good. I can't keep you waiting any longer, I'd like to tell you the 5 Ways Eat Me Ice Cream will keep you COOL all summer long! Meet Eat Me Ice Cream co-owners Catelyn & Amber. They have been making ice cream together for over 4 years and friends for even longer. I could go on and on about how incredible these two are, but go ahead and click on the photo to watch a short video by Palette Films produced last year. They have since updated their packaging, but you will understand what makes them so great and their philosophy on their ice cream. You will leave feeling truly inspired & hungry! 1. Fun, Fresh, and Funky Ice Cream flavors that will leave you wanting more every time. Did I mention Vegan options? Oh yeah. Lavender Goat Cheese. Vegan Curry Cashew with Crystallized Ginger. Mint Ice Cream Sandwiches with Wasabi Peas and White Chocolate. Lilac Ice Cream. Passion Fruit Ice Candy. These are only a few examples of the ingenious flavors that owners, Catelyn Augustine & Amber Odhner have in their flavor wheelhouse. Now before you look at me with crazy-eyes like Suzanne from Orange is the New Black, I would advise you to taste before you judge. Let your taste buds tell you what you really think. I admit their flavors are more adventurous than the average Joe, but that is what makes them so unique. These ladies are not afraid to push boundaries and experiment with new flavors, while still having traditional flavors as well. But one point remains true and that is that they want to give Rochester a REAL ice cream. All the ice cream is made fresh on a weekly basis using locally sourced and organic ingredients with an ever-changing menu based on seasonality. They incorporate ingredients from our local farmers' markets, for example the Lavender Goat Cheese is made using whipped goat cheese from our very own First Light Creamery. Each week, this dynamic duo creates two separate batches, one from Cow's milk and the other from Coconut milk to allow for everyone to enjoy their deliciousness. Eat Me Ice Cream makes me want to do a happy dance! 2. Every Sunday at the Brighton Farmers Market, Eat Me Ice Cream will be ready to greet you with Smiles, Ice Cream Sandwiches, and Ice Candy. You can always find me on Sundays at the Brighton Farmers Market located at the Brighton High school on Winton Rd. The outdoor market opened on May 24th and will last through October 25th, with hours ranging from 9-1 pm. I appreciate this market for so many reasons. There is a great selection of purveyors and food trucks, live music fills your ears, people bring their dogs and it's a more intimate experience vs. other markets. One of the best parts of this farmers market is that you can find Cait and Amber in person. They are hard to miss as you'll see their colorful bike carts & umbrellas right next to the music tent. You have your choice of Ice Cream Sandwiches for $5 or Ice Candy for $3. The Ice Candy reminds me of the flavor ice pops I used to eat when I was little. I had the passion fruit the last time I was there and it was very refreshing and flavorful. You can also buy pints for $9, when the market first opened you were able to reserve a pint of the Lilac Ice Cream and pick it up there. Both ladies are very approachable, so feel free to ask whatever questions you may have and treat yourself to one of their offerings. These Ice Cream Rockstars are at the Brighton Farmer's Market every Sunday. Make sure you stop over and say hello to them! 3. All the Local tie-ins within the City of Rochester makes them easy to find. Let's say you don't get a chance to visit the market, no worries as a number of local restaurants and grocery stores carry Eat Me Ice Cream on a regular basis. Overall, Eat Me typically offers 6 rotating store flavors and 1 seasonal flavor. The flavors will vary by store. You may be surprised at how many of our local establishments carry Eat Me as listed below. 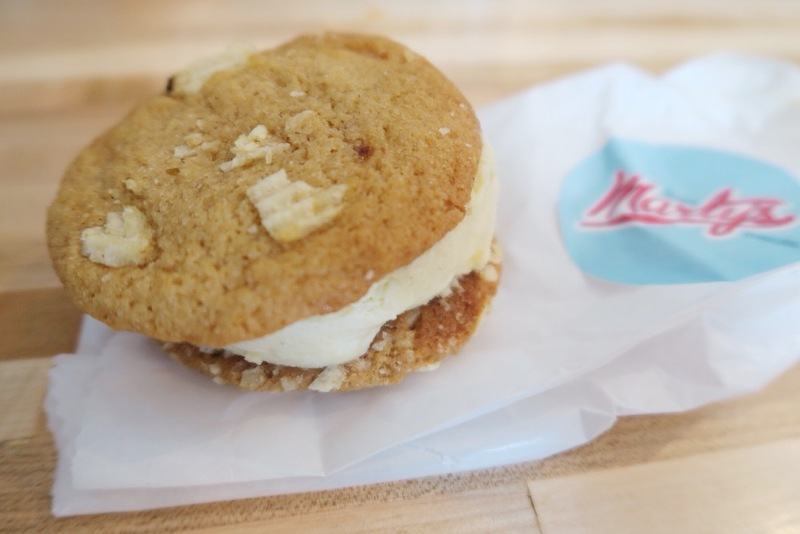 More recently, they created a special beer and potato chip ice cream cookie sandwich for Marty's Meats. Yes I said Beer & Potato Chip Ice Cream Sandwich and YES it is to-die-for. Um beer ice cream with bits of potato chips in a sugar cookie. Hellz to the Yeah! If you have yet to experience Marty's Meats, you have to go immediately! Marty's Meats, known for their standout food truck has recently opened up a location at 703 Park Avenue. Owner & Chef Marty O'Sullivan and Chef Paul Koecheler offer an array of melt-in-your-mouth sandwiches and continue to still operate their food truck as well. I would recommend starting with a Pastrami Sandwich, a side of carrots, and the beer and potato chip ice cream sandwich for dessert. Now that's what I call a meal. Also, a new restaurant is opening up in the South Wedge, Playhouse// Swillburger that will be using Eat Me Ice Cream in their milkshakes to go along with their burgers. They are taking the nostalgia of a classic American burger joint and adding a modern twist with an emphasis on quality ingredients. Plus, they will have arcade games from the 80's and seeing how I am an 80's baby, that's right up my alley. Make sure you help them fund their kickstarter project, so we can eat their burgz and play pinball with them ASAP. This is what pure joy looks like after biting into the beer ice cream + potato chip cookie sandwich at Marty's Meats that Eat Me Ice Cream helped them create. Visit the new Marty's Meats location on Park Ave! The famous food truck recently opened up a location at 703 Park Avenue and has become one of my favorite lunch spots. Here is a photo of Marty & crew doing work. A closer look at this delicious treat. This ice cream sammie is waiting for you! 4. You can learn how to make Ice Cream JUST LIKE THEM. 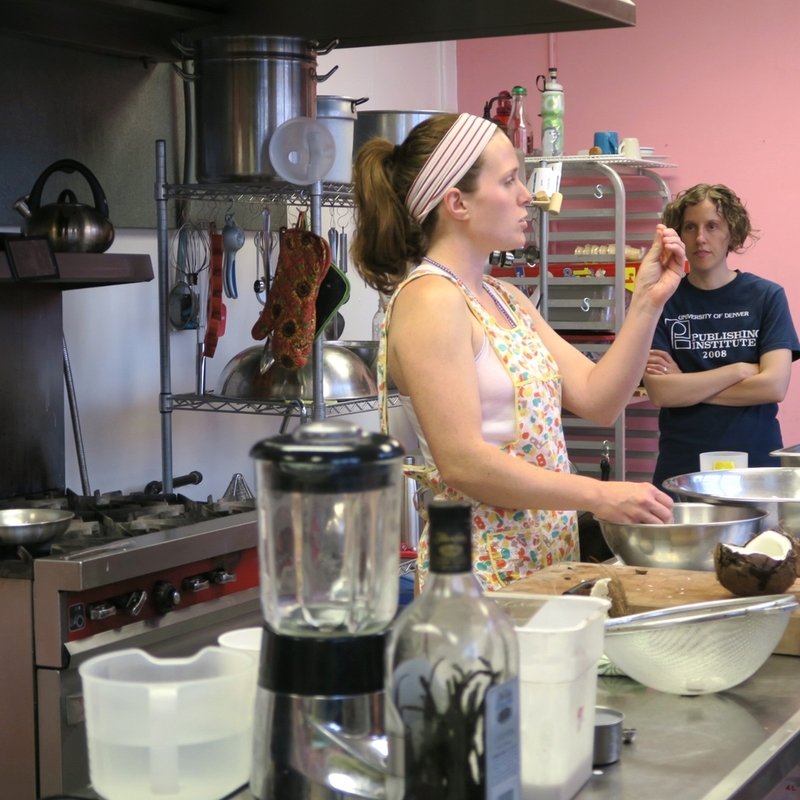 Once a month, Eat Me Ice Cream partners with the Rochester Brainery and offers a class to make either their regular ice cream/custards, dairy-free ice cream or sorbets. Just in case you are wondering where Eat Me Ice Cream makes all their goodies, they have a kitchen in the Hungerford building and this is also where the class is held. Amber & Cait will take you through a step-by-step demonstration on what is involved from the ingredients selected to the techniques used. From flavor creation, to base making and churning, you will learn it all. Not only will you feel like an Ice Cream chef for the day, but you will get a whole pint of ice cream to take home with you. Score! This upcoming August they are offering a class on how to transform delectable summer fruits into frozen treats. Visit this link to hear more details on how to reserve your ticket for the Summer Sorbet & Popsicles class. What a new and exciting way to get to know more about Eat Me Ice Cream and understand why they do what they do. 5. More than just Ice Cream, they have Super Cool events & offerings you won't want to miss. Eat Me Ice Cream is so much more than just the ice cream. They have built a number of relationships within the community and it is a testament to not only the quality of their ice cream, but also how much they value supporting our Rochester community. They also extend their services beyond just selling and making their ice cream, they will actually come to you and do special catering and pop-up events. I wish I had booked them & Marty's Meats at my wedding for an after party treat! See below on what else they have to offer. - First Fridays: Every first Friday of the month, you can stop in and sample Eat Me Ice Cream flavors and also their soft-serve ice cream. First Fridays are a citywide event to support local artists, art institutions, and vendors in Rochester. Tour around & visit all the other artisans in the building. It is a great way to support our community and their crafts. For more details on the July 3rd events and future First Fridays, visit here. - Local Rochester Community Events: Not only is Eat Me Ice Cream apart of First Fridays, but they also consistently take part in many other Rochester Community events. This upcoming Tuesday, June 30th they will be part of the Explore Rochester event called #ROCSTAMEET. Founder, Steve Carter created the Explore Rochester instagram account as way for the community to connect and discover the beauty of Rochester together. This movement has struck a chord in our area and generated excitement & unified our community. The event will be held at Pour Coffee and they will be partnering with Post Magazine for a night filled with friendship, coffee/beer at Pour, goods from Brick and Motor Foodtruck, and Eat Me Ice Cream for dessert! The event starts at 5 pm and I can't think of a better way to spend a Tuesday night! - Beer & Ice Cream Pairing Events: Earlier this month, Eat Me partnered with a new brewery called Lost Borough Brewing Co. for a series called 'The Art of the Craft' pairing beer & ice cream together. Lost Borough Brewing recently opened their doors in November and have some mighty fine beers if you ask me. For the event, they made an ice cream float with Lost Borough's Peanut Butter Porter Ale paired with Eat Me Ice Cream's Roasted Banana Vanilla bean Custard with Toasted Coconut. If you are salivating and interested in the next one, they are holding another pairing event on July 22nd to satisfy your cravings. Details should be posted soon. - Em Luxe Club: Last, but certainly not least, Eat Me Ice Cream is formulating an Ice Cream Club where members only will get exclusive access to try new flavors and special perks. Stay tuned to their Facebook and Instagram for more details! Lost Borough Brewing Co. & Eat Me Ice Cream will be back at it again on July 22nd for another beer & ice cream pairing. As you can see the ladies at Eat Me Ice Cream never stop bringing their A-game. Catelyn & Amber are a force to be reckoned with and serve as an inspiration to Rochester with their hard work, creative vision, dedication to their craft, and love for the community. Your energy is contagious and I can't wait to see what you do next!